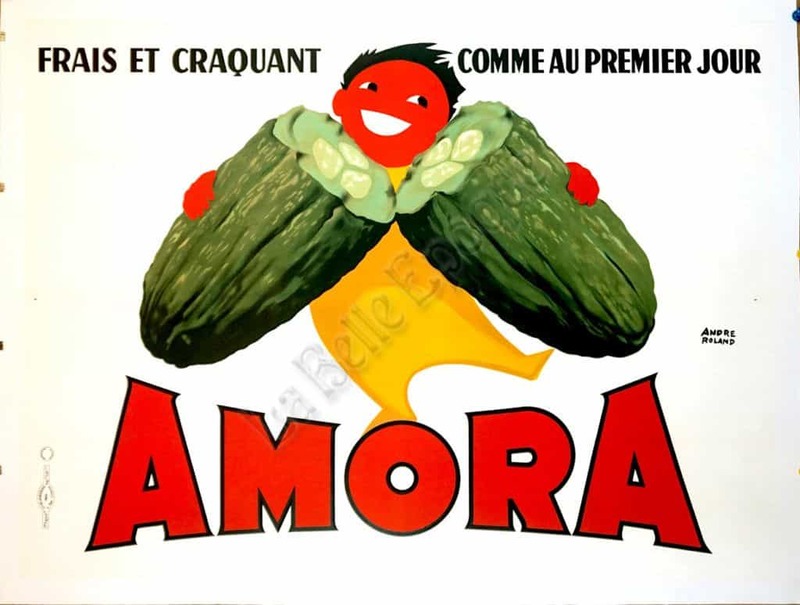 This is a French Mid-Century Modern period advertising poster for the mustard brand, Amora. This poster was created in the 1960s by the artist known as Roland. With its minimal and surreal design, marked by explosive colors and dominant neutral spaces, this poster immediately grabs one’s attention. The vibrant contrast between the realistically depicted pickle and the fantastical central figure creates a dynamic and playful image that is reinforced and exaggerated by the dramatic red typography that reads the company name – Amora – on the bottom. However, the calming neutral space that envelopes this image prevents it from falling into the grotesquely surreal, imbuing it with a playful elegance that is deeply reminiscent of the artistically rich mid-century French period.